“What do you do with your gear when you hop off your bike?” begins Mike Ashie’s Fundable profile. Good question – motorcyclists are often left with the uncomfortable choice of either toting their gear awkwardly along after demounting their bike or leaving it with the bike and at the mercy of any looter who happens to be in the vicinity. 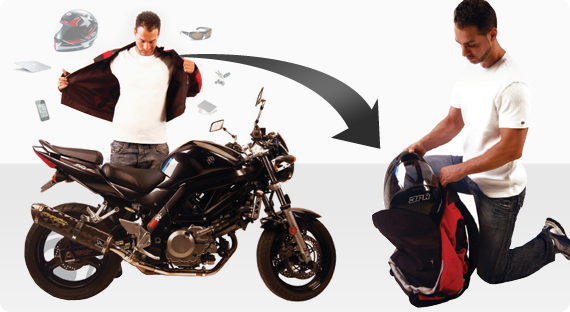 Enter Alomar, the durable motorcycle jacket that transforms (like Optimus Prime) into a snazzy backpack! Alomar utilizes high quality raw materials to create a lightweight, attractive, and most importantly protective final product. The jacket itself is made of 600 Denier Polyester Nylon (spaceship material) and boasts Teflon shoulder/elbow pads. What more can one ask for? A pocket! Leaving no stone unturned, Mike has included a large pocket on the back of the Alomar designed to carry “iPad, laptop or anything that can fit flat across your back. It's one less thing to carry!” Needless to say, this product has caught the attention of motorcycle enthusiasts from sea to shining sea – including 2Wheel Tuesday! This useful product is currently at 32% of their $10,000.00 Fundable goal with 23 days left on the counter. Back them today by clicking here.